Earlier this year I shared the Oreo cookie wedding cake and at the time I thought nothing could be better than that! 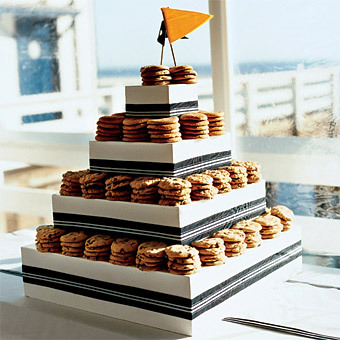 This chocolate chip wedding cake tower might give that Oreo cake a run for its (milk) money. This chocolate chip tower would be so fun at any wedding reception – and if you wanted to have a “traditional” cake you could still do that too. But imagine how much fun it would be for your guests to enjoy chocolate chip cookies and a glass of ice cold milk! We found this “cake” here.